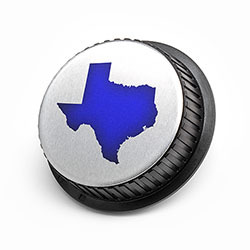 LenzBuddy™ custom lens caps are the newest offering from IMPACT PHOTOGRAPHICS in Dallas, Texas. IMPACT, a manufacturer of photographic specialties, is a family-owned business in operation since 1990. Owner and LenzBuddy creator Brian Herbert is a photographer in his spare time. It was during the Summer of 2012, he was digging through his own bag of lenses labeled with a Sharpie on masking tape (or not at all) that he was inspired to create this great system for easy identification. And so LenzBuddy was born – a line of replacement caps for lens and camera body to protect and clearly label all that expensive gear and totally organize your camera bag. LenzBuddy is available for all Canon and Nikon mount lenses and camera bodies. Choose from standard styles or customize your own. Our caps are perfect for all photographers, and they are being used by some of the biggest rental companies in the camera biz to protect and identify their sizable inventories as well as to advertise their enterprise. We've also been picked up by retail powerhouses like B&H Photo, and Adorama. Feedback continues to be very positive. We take pride in making a quality product and strive to have great customer service. If you have any questions or concerns please call and let us know. We love to talk on the phone and look forward to each and every customer’s feedback!